After years of being asked “how are we doing?” and “who’s doing better?” from agencies all over the country, the leadership team at 3% realized the ad world is largely well-intentioned around gender-friendliness, but operating without clear direction on how to truly support more women into creative leadership. In order to give agencies a roadmap, we conducted a survey of women in the advertising industry in August of 2015 and presented the findings at The 3% Conference on October 26, 2015 in New York City. Because it’s been proven that the ad world does not have a recruitment problem when it comes to female creatives, but a retention problem, the key goal of the survey was to determine what makes women STAY in creative positions. The solution? 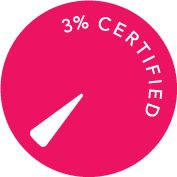 We are thrilled to announce 3% Certified, an independent assessment system to support agencies in their effort to retain and promote women into leadership. It requires more than good intentions of gender-friendliness to change long-standing underrepresentation of women in creative leadership -- it requires an honest, unbiased look at what is holding women back and the actionable steps to make real and lasting change. This level of certification will be reserved for agencies whose scores are well beyond the benchmarks set by 3% for a healthy and prosperous environment for female creatives. 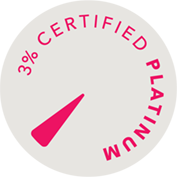 This level of certification will be given to any agency whose overall score falls at or beyond the benchmarks set by 3% for a healthy and prosperous environment for female creatives. During a 60 day vetting period, agencies unpack their policies, programs, systems, and the cultural intangibles around women in their workplaces in partnership with 3%. Our team of advisors work with each agency to assess how they stack up on the criteria. Based on self-reported data, in-person interviews, and external research, the participating agency will be evaluated. Also included is a dedicated time period during which all agency employees are able to provide anonymous feedback about their experience working in the agency environment via an outside feedback channel. Once the evaluation has been completed, the agency is awarded the appropriate level of 3% Certification. In addition, the agency will receive a concrete roadmap that includes a set of recommended solutions and strategies for improvement. Agencies must apply for re-evaluation every three years to keep their certification status current. Are you frustrated you keep losing your high potential female talent? Are you ready to see your work be more aligned with the marketplace by having more diverse creative teams? Are you eager to support more women into leadership? Is your agency ready to take a hard look at what you are doing right and where you have room to improve? If you are interested in being on the cutting of edge of change for our industry, please contact our Director of 3% Certification, Erica Buteau, and a member of our certification team will be in touch shortly.